Tocasaid: Aye can? My Erse. Its census time and the onslaught against our indigenous culture continues. The auld myths about Scotland and her cultural roots are being trotted out by everyone from the General Register Office of Scotland to Newsnet Scotland. It is often said that 'divide and rule' is the best strategy of the aggressor. And thus, we were divided. Scotland became, not the Celtic kingdom of Alba, but a nation divided between 'Highlands' and 'Lowlands'. This took time though and this distinction between Highland and Lowland only emerged relatively recently. Highland was 'Gaelic' and Lowland was... well, what was Lowland? The Anglo-Saxons brought 'Inglis' and Inglis it was until it suddenly became 'Scottish'. What then of Scottish? Scottish became Gaelic, Highland or even worse 'Erse'. More than divide and rule, the Scots found themselves identified by another nationality and thus dispossessed. The Lowlands therefore became the sole preserve of Inglis/ Scots - even though at the time much of the Lowlands was still Gaelic speaking. Scotland then became 'Northern Britain' and eventually the powers that be, in a fit of irony, even decreed that Inglis was just 'badly spoken English'. This supreme piece of anti-Scottish spin-doctoring and cultural airbrushing provided the perfect springboard for centuries of repression starting with the Statutes of Iona, continuing with the Clearances and the education act of 1872 that permitted the forcible Anglicisation of Gaelic-speaking children and communities until the present day when one can still read derogatory comments about 'Erse' and 'garlic' in the comments sections of the Daily Mail and Scotsman. It can allow the likes of Marilyne Maclaren - Edinburgh's education chief (!!!) - in her attempt to hinder the establishment of a stand-alone Gaelic medium school in Edinburgh to claim that Gaelic's place is in 'Argyll or the west Highlands'. Are Gaelic and Scots different things? Yes. Scots belongs to the Germanic family of languages (which includes Dutch, German, English and Swedish) and has traditionally been spoken in the southern and eastern parts of Scotland known as the Lowlands. Gaelic, on the other hand, belongs to the Celtic family of languages (which includes Irish and Welsh) and has traditionally been spoken in the northern and western parts of Scotland known as the Highlands. Yet ours is a rich language , spoken by plain men and men of learning for many centuries . John Barbour wrote in Scots for the Scots King when the English monarchy and aristocracy spoke French and English was regarded as a rural patois . Let it be remembered that , such was the strength of the Renaissance in this country , The Aeneid was translated into Scots before it was into English . This is no ill-spoken rustic dialect . It would be tragic were it to disappear . Or , worse , be killed by the onslaught of meejah culture and aggressive Gaelic promotion . I am a Scotsman . I speak Scots , not Erse . The Census , due on the 27th of March , asks questions about our fluency in the guid Scots . It is incumbent on all who love our country and its heritage to answer truthfully and support oor mither tongue . that, just as in Arran, it had survived to the present day." This is not to paint Scotland/ Alba as a monolingual nation. I'm unsure if such a concept exists. Even the relatively linguistically 'pure' Iceland has a smattering of Gaelic placenames, handed down from Celtic monks who reached the islands before the Norse and latterly by Gaelic-speaking slaves brought there from their homelands of Scotland, Man and Ireland. Some seek to muddy the waters by highlighting Pictish and 'Welsh'. Though the minute someone speaks of 'Welsh' in a Scottish context, one should treat their arguments with the same amount of salt you'd give to a Daily Mail article. Brythonnic which was closely related to Gaelic was spoken here and is evidenced in poetry - Y Gododdin - and in placenames - Niddry for a starter. However, Watson in his 'Celtic Placenames of Scotland' states that 'there are more placenames of Gaelic origin around Peebles than those of Brythonnic origin'. The strange conclusion for some though is that 'Welsh' was spoken in the Lothians but not Gaelic. Were pre-Celtic Pictish, Brythonnic or Norn in the Northern Isles still to exist then their survival would be equally important. I get the feeling though that even in that situation, we'd hear the same complaints from the same people. "Gaelic place-names are found in the north of England." So, what of Scots? There is no doubt that a northern branch of Anglo-Saxon did develop separately to that spoken in much of England and that it too has a place in our culture. Most of us still speak it to some extent, though I'd argue that for most us, it has become very much diluted and not only by 'standard' English but by recent inputs from Hispanic, African-American and American English. I'd argue that 'Scottish English' would be a more suitable and honest term for this tongue. This is not acceptable to some though - including some nationalists who have now started to revise history by claiming that 'Scots' and not 'Inglis' was historically spoken in Alba. As mentioned, 'Scots' was a term that was pasted onto 'Scottice' in the 1600s and even today is not a universally recognised term by its speakers - Lallans, Doric, Scotch or the more regional Shetlandic are as often heard. Possibly because some see these Anglo dialects as being sufficiently different from each other to qualify as languages in their own right. The cumulative effect of this romantic airbrushing, historical revisionism and aggressive anti-Celitc prejudice is that many Scots do feel that Gaelic is 'foreign' to them. Ask them to explain their local placenames and they're stumped. Ask them what the daily language of William Wallace and the Bruce was and you might get a shrug of the shoulders and the reply, 'English?'. Ask them the source of the icons which give us our Scottish identity - even accounting for Victorian remixes by Walter Scott et al - such as bagpipes, whisky, tartan, the clans, the Stone of Destiny, ceilidhs, shinty (and arguably golf), the toponymy of lochs, bens and glens... and you'll get another shrug. 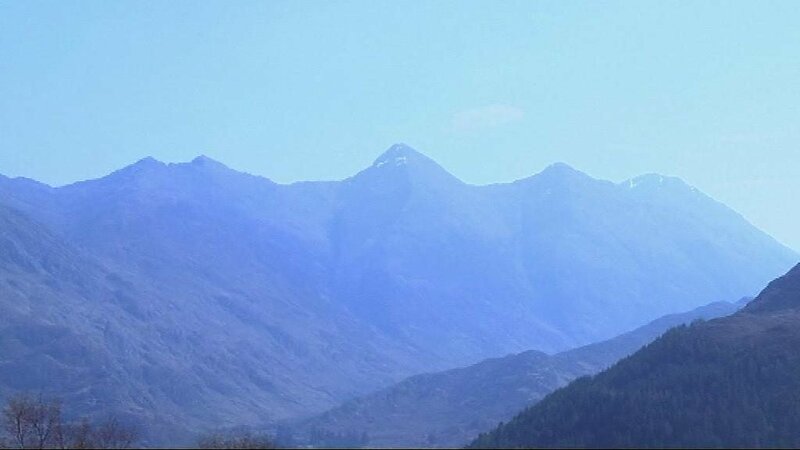 I once witnessed a folk singer in a Highland Perthshire pub being questioned by a German on the meaning of the line 'tha tighinn fodham' in the auld pro-Jacobite song 'Rise and Follow Charlie'. He looked puzzled for a few seconds and then replied, 'well, they're just kind of... Scottish sounds'. The new Scotland? Forward with ignorance? Is it any wonder that tens of thousands of our youngsters tend to identify with an 'Old Firm' view of their lives in Scotland - Irish, Ulster Scots, British, English, Irish Catholic, proddie, 'Norn Iron' and Orange. Anything but Scottish. Let us continue to speak our own form of Anglo-Saxon. Let us marvel at the words and use them in place of 'standard' English. Let us embrace the diversity of our new communities. But, we should be under no illusion that it was Gaels who gave us our nation, our iconography and much of our nomenclature. We should also ensure that it does not go the way of Pictish or Brythonnic. This essentially mixed situation, quite the reverse of black and white, characterised in the late medieval period and in the sixteenth and seventeenth centuries the gradual disappearance of the eastern Gàidhealtachd. The contribution of the 'western Gàidhealtachd' to the history and culture of Scotland may in some quarters have been sadly misunderstood and underrated, but it has never been in danger of being lost to sight. I would like to balance west with east by highlighting what I believe to have been the historically and culturally permanent contribution of Gaelic language and social organisation to the east of the country and the lowlands in general." Gaelic, on the other hand, belongs to the Celtic family of languages (which includes Irish and Welsh). 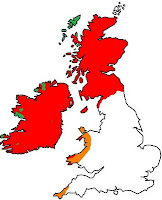 In recent centuries Gaelic has mostly been spoken in the northern and western parts of Scotland. I said I take a look at your site, so I thought I'd say hi while I was passing. Tha an aiste seo sònaraichte math, ceud taing! Feumaidh sinn ceann a' mhaide a chumail riutha! Amazing that an official site can get away with such a misleading statement. I also agree that Gàidhlig = Scots. "So, what of Scots? There is no doubt that a northern branch of Anglo-Saxon did develop separately to that spoken in much of England and that it too has a place in our culture. Most of us still speak it to some extent, though I'd argue that for most us, it has become very much diluted and not only by 'standard' English but by recent inputs from Hispanic, African-American and American English. I'd argue that 'Scottish English' would be a more suitable and honest term for this tongue." Many argue that Gaelic is dead because of heavy influence from English --Tha mi a wondradhadh me dheidhinn nan ambulances and all that. But the existence of the diminished form doesn't deny the existence of a stronger form in some speakers. So why is it OK to deny the existence of Scots by pointing out the entirely obvious fact that some Scottish people actually speak English? Well "Wallace" was an Anglo-Saxon surname (yes, surname -- not a "Gàidhealach" concept) for Brythonic speaker (cf "Welsh"). He is thought to have spoken Norman too, and, yes, Gaelic. De Brus was a Norman nobleman with a Gaelic-speaking mother, who also spoke Scots. It's reasonable to assume that both owe their success in no small part to their multilingualism -- both men had the unenviable task of trying to unite the clans from the Highlands and the Lowlands, as well as the Norman feudal lords. If they had sat around arguing about the "true" language of Scotland, there would be no Scotland today. 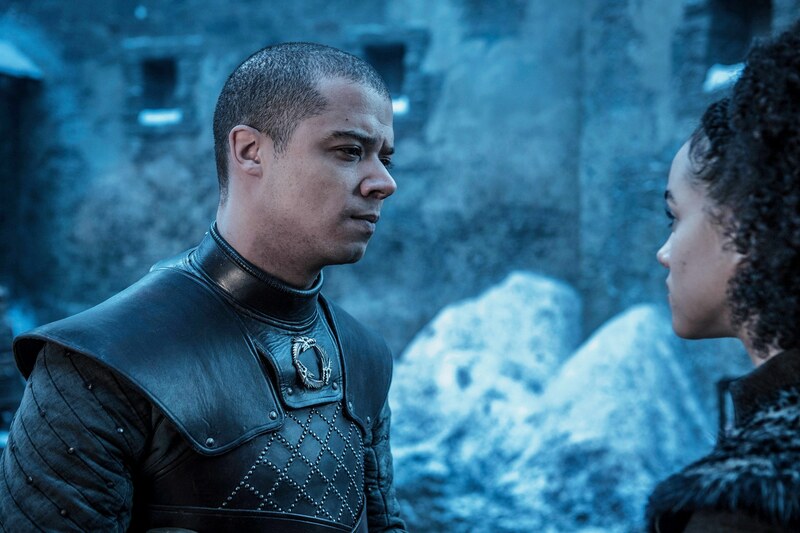 So howsabout we stop bickering and follow their example? Can we start working together? Inntinneach. Wondradhadh... could be aruged that this is Gaelic to English to Gaelic again as the present participle in English is thought to have come from Gaelic or Welsh. German lacks this - er kauft > tha e a' ceannachd/ he is buying. The difficulty with Scots/ Inglis is its very closeness to 'English'. It could also be argued that 'English' no longer exists simply because of its universal nature. Can a Glaswegian be easily understood by a Cockney or Jamaican? English/ Anglo-Saxon has absorbed so many words from so many sources it has little resemblance to its Germanic roots. And aye, for a long time, Anglo-Saxons were Gaelicised due to Gaelic being the language of the Kingdom of the Scots. The language of the armies of Bruce and Wallace was Gaelic and apparently their war-cry was 'Albannaich'. Bruce could not have spoken 'Scots' - perhaps some Inglis/ Old English but 'Scots' did not emerge until the 1600's. And this, is the main point - 'Scots' is Gaelic. I don't deny the existence of our own AngloSaxon - but to call it 'Scots' is incorrect. Not a fashionable stance, I admit, but one I maintain. As a Lowlander and Gaelic speaker who speaks 'Lallans' to some degree, I don't see the maintenance of 'Lallans' as priority over Gaelic. Calling a' Bheurla Ghallta 'Scots' is a red herring and one used to the detriment of Gaelic. I'd rather see Gaelic accepted as 'Scottish' and not 'Highland' or 'Erse' than try and define the line between one Saxon dialect and another. Speaking of the continuous, one of the interesting things about the emergence of Modern English isn't really discussed. It's normally described as emerging in the Elizabethan era, and Shakespeare is cited as one of the first major writers of Modern English. But Shakespeare didn't use the progressive aspect. What happened next? Elizabeth croaked without bearing a child, and so began the Jacobean era, with the Scots-speaking court of James VI decamping from Edinburgh to London. But you are using names as though they had intrinsic meaning -- "that which we call a rose" and all that. The term "Old English", for example. You're happy to use it because it implicitly supports your argument. But the Beurla-speaking Galltachd was part of an "England" for a vanishingly small period of history. It was part of Denmark for a similar amount of time. You abbreviate "Anglo-Saxon" to merely "Saxon", which denies the vast differences between the spoken tongues of the various Germanic tribes that had invaded Great Britain. But those differences existed, and the common ancestor of English and Scots was a language spoken on mainland Europe countless years before the invasion -- Anglo-Saxon is an umbrella term. The fact that the speakers used the same name doesn't mean they are the same language. Compare "Gàidhlig" and "Gaeilge", "castillano" and "català", "romansch" and "română". All of these pairs are essentially the same name, but the languages they denote are markedly different. Calling Scots "English" is no different to calling Gaelic "Erse". And while I don't see the maintenance of Scots as priority over Gaelic, it's not a choice of one or the other. The demand for Gaelic medium education has already outstripped the supply of native-speaking teachers, and BnaG are overreaching themselves by fast-tracking non-natives into teaching posts. As for Lallans -- that's only one variety of Scots. It is an exclusive term that doesn't include Doric or Shetlandic (among other varieties). I object to the neologism "Albais" in Gaelic -- it's unnecessary and is to the detriment of Gaelic -- but Scots is now an established term, and to change it would be to the detriment of Scots, which is already an embattled language and could do without getting another knife in its back. Its amazing the number of anti-Gaelic bigots who use 'Scots' as an excuse for their bigotry. 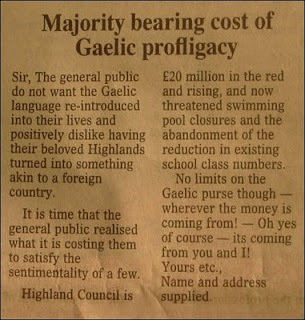 I remember Moray council denying demands for Gaelic-medium education because the locals apparently all speak Scots! Why should THEY give Erse to their kids?! Suas leis a' Ghaidhlig. Shin e. O bhun gu barr.